This epiosde of The Engineering Commons finds Adam, Brian, and Jeff discussing what it means to be relevant, and how engineers can increase their relevance on the job. Brian is not entirely sure what a thought leader is, but he’s pretty certain he doesn’t want to be one. Jeff opines that one’s relevance is largely dependent on others; seeing yourself as relevant is not nearly as important as having others perceive you as relevant. Brian notes that engineers often get hired based on the skill set needed to complete a behind-schedule project, rather than their abilities in getting a fresh project off to a good start. Lewin’s change management model (unfreeze, change, refreeze) is referenced by Jeff. We talked with Kathryn Jablokow about creative diversity in Episode 76; it’s possible to be creative through both adaption and innovation. Jeff makes the point that it’s possible to be relevant in many different ways, ranging from abstract observations to specific implementations. Brian references Occam’s razor in describing the difficulty one encounters in pursuing clarity of meaning and intent. Robert Greene’s book “Mastery” has been on Brian’s reading list for a while. Jeff makes the case that one can be relevant as a leader, follower, or rabble-rouser. His mental image? The “marching band” scene from the movie Animal House. A 2014 book, “The Second Machine Age: Work, Progress, and Prosperity in a Time of Brilliant Technologies,” is tangentially mentioned by Brian. Jeff suggests building an emotional bond between humans and artificially created art is difficult (apparently forgetting about Japanese singing sensation Hatsune Miku). Adam puts out a request for a few engineering robots, if any of our listeners can access advanced AI technology. 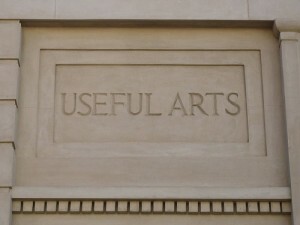 Thanks to Richard Adams for the photo titled “Useful arts?” Podcast theme music by Paul Stevenson.